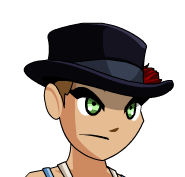 Description: l wouldn't wear this tophat to go boarding on the half-pipe. Better to swank it up at a wedding or other classy event! Congratulations to Prince William and Kate Middleton on their wedding day. Rose is Color Custom to Accessory Color. Strap is Color Custom to Trim Color. Thanks to Lord Bennington, OmfgRly and Xia.